After a fairly long, snowy winter here in Vancouver, it seems like Summer is finally on its way this week. Over the last few days it’s been hot, sunny and everything in sight has bloomed. Naturally, we’ve all been eating ice cream here! 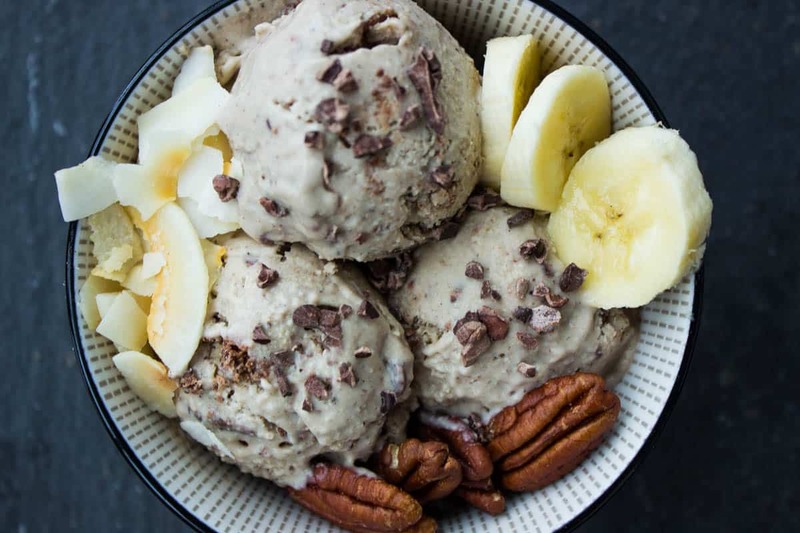 I’ve wanted to create an ice cream recipe for a while and I love the combination of chocolate and banana in this one. 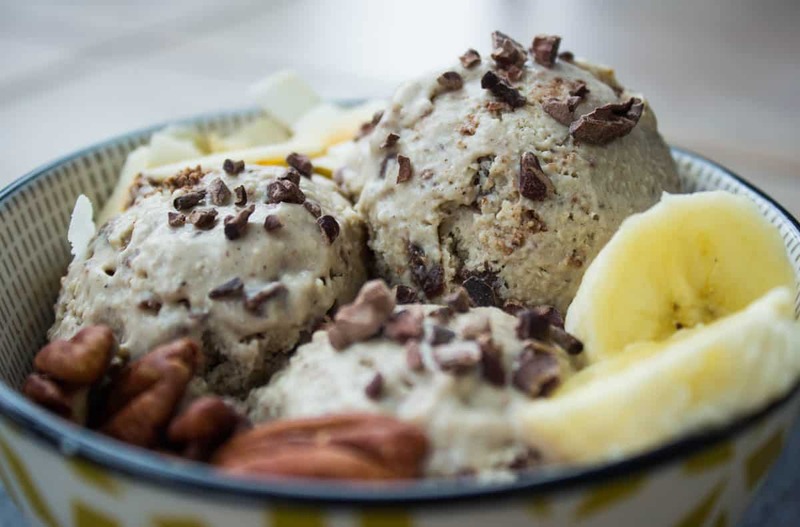 Banana isn’t something I usually use as a flavour, but in this Banana Chocolate Fudge Ice Cream it’s delicious! 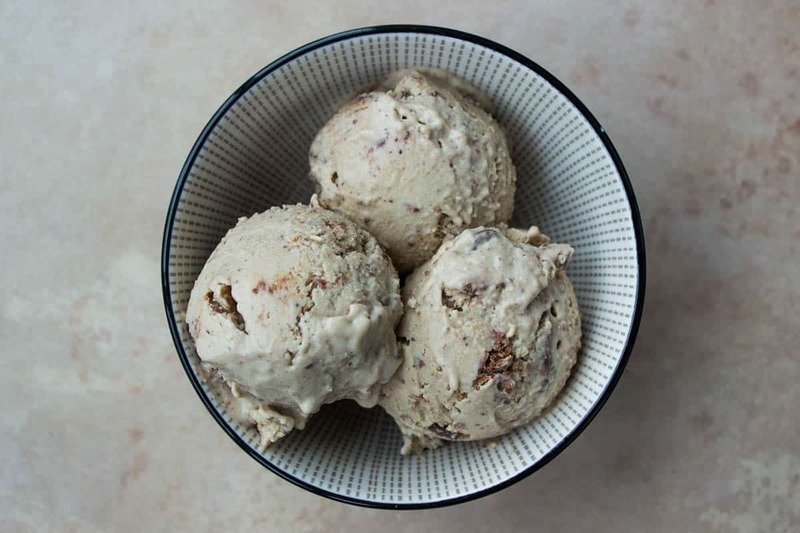 Combined with coconut milk and creamy cashews, this ice cream is rich yet light, and not overly sweet. There are just a couple of points to note in this recipe – as mentioned below, coconut butter is different to coconut oil and the oil should not be used as a substitute. Coconut butter is a creamy paste made from coconut flesh, and is available in most health food stores. It helps give the fudge a great taste and provides a good texture. Secondly, as I’m always pointing out in my recipes, live by my golden rule when it comes to coconut milk: buy the best you can afford! Not all coconut milks are created equal and you want to buy one that is as creamy as possible for the best possible taste. I like using Earth’s Choice or Whole Foods’ own brand. Store it in the fridge until needed and then the milk will separate easily into cream and water. Have fun! To make the fudge, heat the coconut butter, coconut oil, cacao powder and maple syrup on the lowest possible heat until the butter and oil have melted. When all ingredients are just combined, pour into tupperware and refrigerate for 30 minutes. While the fudge is freezing, make the ice cream by blending all ingredients in a high speed blender for one minute. Spoon the mixture into tupperware and freeze for 40 minutes. Remove from the freezer and stir vigorously with a metal spoon to ensure that any ice crystals are broken up. Repeat the process of freezing the ice cream for 40 minutes then stirring vigorously 3 more times until the mixture is thick but not solid. Roughly cut the fudge into small chunks and gently stir into the ice cream. Freeze for 1 hour more (the ice cream should be thick and frozen but not solid) then serve with toppings of your choice. Enjoy!